The Ninth Ward neighborhood in New Orleans has been on the tip of many tongues over the course of the past two weeks. This area, also known as the Bywater, is the part of the city that has been under the most water since Katrina hit and the levee broke. Just down-river from the French Quarter, this is an historical neighborhood that many famous residents have called home: trumpeter Kermit Ruffins, the musical Lastie family, poet and author Kalamu ya Salaam, and rock-and-roll legend Fats Domino, who was rescued from his house in the Ninth Ward just last week. But on the corner of Saint Claude Avenue and Clouet Street, there is another star in this neighborhood’s galaxy. The Saturn Bar is a humble little building with a small sign and a few bits of neon lighting the way to the corner door. 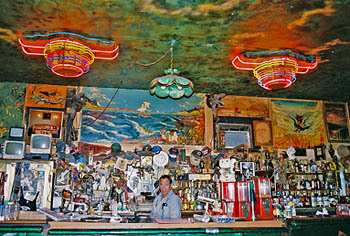 Inside, the light from the neon soon reveals an array of treasures from wall to wall and ceiling to floor. O’Neil Broyard is the caretaker of its contents; he is a native of the city and has been at the helm of this neighborhood joint for more than forty years. When his regulars come calling, you’ll find him behind the bar, popping the cap off of an Abita or pouring a little Wild Turkey. But if it’s slow, he’ll be busying himself somewhere among his vast collection of baseball caps and garage sale paintings, tending to his flock of animals, or fiddling with his urban garden. With the time Broyard spends cultivating seeds, he could garnish more cocktails than he cares to even sell. He has a collection of fruit trees, a few vegetables and dozens of tomato plants. There have actually been times that Broyard has reaped such a harvest that he would share the bounty with his customers, regulars and tourists alike. He even grows mirlitons, a squash that’s used regularly in Creole cooking and a vegetable that is celebrated each year with the community-wide Mirliton Festival. What constitutes the fabric of a community? The streets? The buildings? The businesses? The people? These things are certainly part of the warp and woof of any neighborhood. But what about the corner bar? 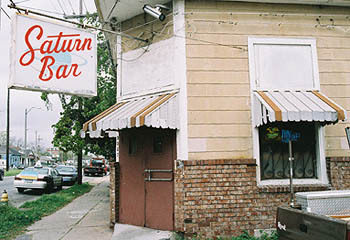 Clouet Street is under water, but The Saturn Bar beckons to all of us as a reminder of the small treasures tucked in and around a city like New Orleans and the role that they can play in a neighborhood like the Ninth Ward. It’s not Galatoire’s or Commander’s Palace. It’s a little brown building with a door that opens to a community. It’s the thing that connects that community to the rest of us—and to the rings of Saturn. While there have been so very many losses to mourn these last two weeks, we can now allow ourselves a hint of celebration: O’Neil Broyard and his beloved Saturn Bar have survived the storm. Now, he and his flock wait for the streets to dry up and for their neighbors to return. Again and again, many thanks to Josh Friedland for the invitation to contribute to The Food Section. Beautiful images and voices from New Orleans. Thank you Amy for going beneath the tourist surface to ask that question--"what makes a community." 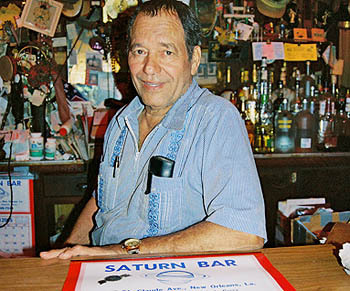 The Saturn Bar was always one of my highlights during my frequent visits to New Orleans. I breathe a sigh of relief to learn the Saturn will reopen one day - hopefully soon. Thanks for all the good times! O'Neil carried V.E.P. Chartreuse at my request, and charged me half as much as other places for it. As long as you didn't ask for water or pay with a twenty, Saturn Bar was as comfortable as home. I even met Nicholas Cage there right after he won an Academy Award for Best Actor in Leaving Las Vegas. The Saturn Bar is re-opening! The set date for the grand re-opening party is Saturday, June 17, 2006. We will be open the say before (Friday) due to several requests from Saturn Bar patrons. Feel free to e-mail me with any questions or comments, and make sure to check out our myspace site. Thanks. This is a good website! Thanks! I asked what kind of food you have and it says nothing at all. This location was one of the most important one in the '90th years. I believe the spirit of these years is still present in this location. This is a funny website,thank you!